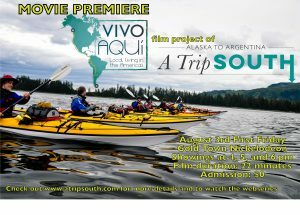 The A TripSouth video, VivoAquí: Local Living in the Americas will be showing in Juneau at the Gold Town Nickelodeon Theater on August 3, 2018 for First Friday. There will be showings at 4, 5, and 6 pm. The film is 22 minutes in duration and will feature some of the best bits of wisdom that we found in our two years of traveling along the west side of North, Central and South America. Vivo Aquí is intentionally broad and open to viewer interpretation. We made a film that contrasts the typical “adventure narrative” genre. The goal was to let the people we encountered speak for themselves, with minimal distraction by our own personal narratives. The “take home message” of this project may be different for every viewer.